Wilwood’s new DynaPro Honda/Acura Caliper (DPHA) for Honda and Acura models originally equipped with 262mm diameter rotors. These calipers bolt directly to the stock mounts on factory spindles, fit over the OE 262mm diameter rotor, accept the OE brake hose, and clear many factory aluminum wheels including the EM1 Si 15” wheel. Designed around Wilwood’s proven DynaPro series four piston calipers, the forged billet bodied DPHA caliper delivers high-strength clamping force and positive stopping power. 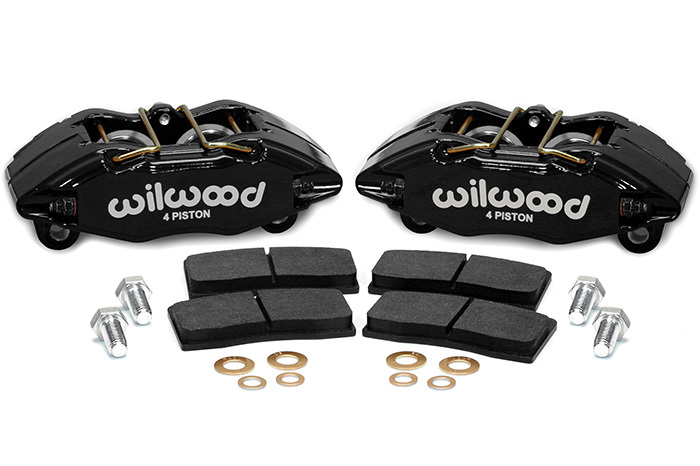 Four stainless steel pistons provide fully balanced pad loading, along with the corrosion resistance and thermal retardant qualities of the stainless alloy that will keep your calipers cooler and running trouble free for many more miles. Calipers work perfectly with the OE master cylinder and ABS functions, and are available with either black or red high-gloss, high-temp, brake fluid resistant sealed powder coat and feature Wilwood’s signature logo.